IRAAL connects language lecturers, language teachers, and researchers in linguistics, applied linguistics, and sociolinguistics with an active community keeping up with the latest language developments and offering lectures and seminars across Ireland. IRAAL's history dates back to its foundation in 1975 to support research in applied and general linguistics in Ireland. IRAAL is affiliated with the International Association of Applied Linguistics (AILA) and pursues its aim of supporting research by organising seminars, lectures, conferences and workshops. Its publications include the annual bilingual, open-access online academic journal TEANGA as well as special volumes on specific topics. Membership is open to everyone with an interest in languages or linguistics. Congratulations to IRAAL Executive Committee Member Dr Stephen Lucek, University College Dublin, who was awarded the ‘Maurice J Bric Medal of Excellence’ for his research on adolescents’ use of language in Irish secondary schools. 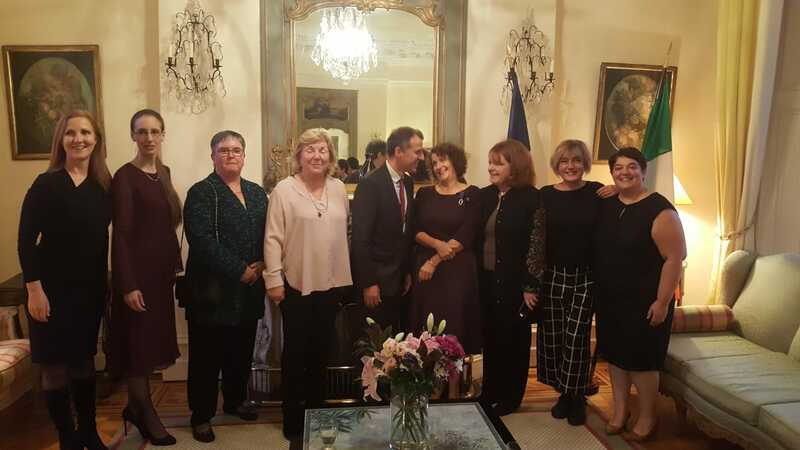 ​​Congratulations to IRAAL Executive Committee Member, Dr Marie-Thérèse BatardièreDr Marie-Thérèse Batardière (University of Limerick) has recently been made a Chevalier de l’Ordre des Palmes Académiques, in recognition of her record of service to French-language education. Dr Batardière received the award from the French Ambassador to Ireland, M. Stéphane Crouzat. We send our warm congratulations to Marie-T on the well-deserved recognition of her excellent work and outstanding commitment to language education. It is with immense pride that IRAAL and the Centre for Language and Communication Studies at TCD announce the recent conferring of Honorary Membership of AILA upon Professor David Singleton. AILA, the International Association of Applied Linguistics, to date has only elected 8 honorary members, all true international luminaries in the field of Applied Linguistics. AILA Honorary Membership is conferred to those who have made outstanding contributions to AILA or to the field of Applied Linguistics. David Singleton took his B.A. at Trinity College Dublin, and his Ph.D. at the University of Cambridge. He is an Emeritus Fellow of Trinity College Dublin, where he was Professor of Applied Linguistics. He now holds the title of Professor Emeritus at the University of Pannonia, Veszprém (Hungary) and Professor at the State University 0f Applied Sciences, Konin (Poland). He has served as President of the Irish Association for Applied Linguistics, as Secretary General of the International Association of Applied Linguistics and as President of the European Second Language Association. His publications number more than 200, his books and articles ranging across a wide spectrum of topics – but focusing mainly on cross-linguistic influence, the second language lexicon, the age factor in language acquisition and multilingualism. He is co-author of Key Topics in Second Language Acquisition (2014) and of Beyond Age Effects in Instructional L2 Learning (2017). He is the founding editor and continuing co-editor of the Multilingual Matters SLA book series. In 2015 he received the EUROSLA Distinguished Scholar Award and in 2017 was awarded Honorary Membership of AILA.